Your guinea pig is the sweetheart of your family. You want to give them the best of everything and needless to say, you want the best cage for them too. But there are many types of cages available in the pet care market. You cannot compromise on the quality, make or design of the cage as it is the one place where your little fur ball is going to spend most of its time. If you want them to be happy, then you have got to get them the perfect cage.So how do you decide which one is perfect for you among the many varieties? Here are some detailed reviews and comparisons of the top 5 best guinea pig cages available in the market. 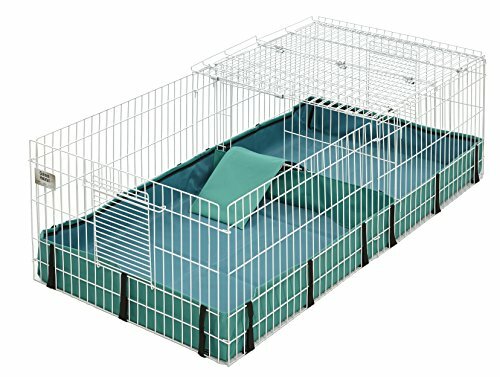 Should I always buy a large cage for my guinea pig? What is the right temperature for your guinea pig home? Is it good to have my guinea pig live inside my house? 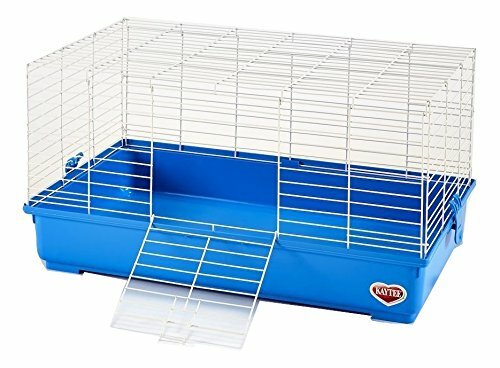 Is it better to get a complete kit of a guinea pig cage or is it ok to get a regular one? Do I need to put extra bedding if the flooring is canvas? 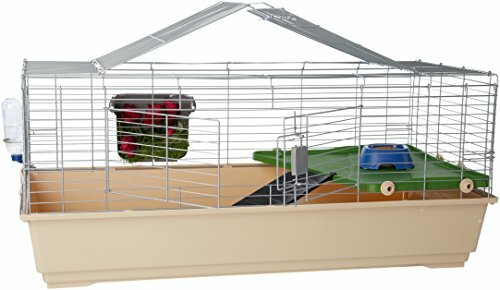 What is the best solution to clean guinea pig cages? 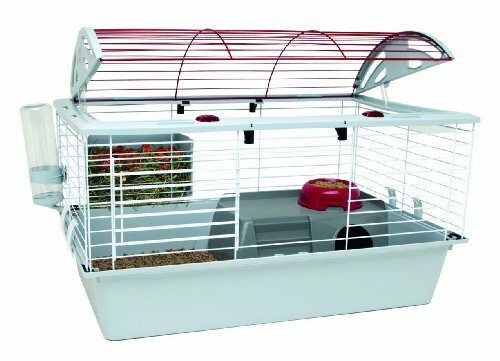 Kaytee Complete Guinea Pig Kit, 30" x 18" x 16.5"
Ware Manufacturing Animal House 35"
This is a premium-quality guinea pig cage from the house of MidWest Homes for Pets. It provides an enormous 8 square feet of living space for your guinea pigs along with durable and removable parts for ease of use and assembly. It is perfect for families that like to pamper their guinea pigs. The 8 square feet of living space provided by the “Guinea Habitat” is veterinarian recommended for the proper growth and development of guinea pigs. It also consists of a fully removable wire mesh top for protection from external predators. One of its main highlights includes the multi-access folding top and divider panels that have hinged “lock-in-place” doors to separate the play and care areas. It also has durable PVC lined canvas bottom that is leak proof and soft for your hamster’s sensitive feet. Its sides are 14” high for secure and convenient access to your guinea pigs. The 8 square feet of living area provided by the cage is definitely one of the best highlights. It is the recommended by veterinarians for their healthy living. As it has a removable wire mesh top, it keeps your guinea pig protected from external predators while at the same time giving it the required fresh air. The PVC-lined canvas bottom is also quite durable, leak proof and easy to wash. Hence it is perfect to be installed outside and is soft on the surface for the sensitive feet of your guinea pig. The sides are 14” high as well, which gives ample access to your guinea pigs as well. Considering the fact that the guinea pig cage is 8 square feet wide, it is quite bulky and not easy to be carried around. Put together with the many parts of the cage, it might take a while to get the cage installed in place. Also, some of the additional parts like the divider panel and the canvas bottom come at extra costs. This is a completely safe, well ventilated and comfortable home for your guinea pig created by Living World. It is called their Deluxe Habitat and it is indeed everything that your guinea pig needs for comfortable living. The Deluxe Habitat is a complete kit for your guinea pig that comes with a full wire cage with a plastic bottom cover, an access ramp, a tip-proof food dish, a spill-proof water bottle and a hay guard. Its second best highlight is the fact that it very easy to install and can be set up with plastic clips. It is 30.7 inches in length, 18.9 inches in width and 19.7inches in height. The price is a little on the higher side for the Deluxe Habitat. However, considering that you get so many features with it, the price is justified. Also it does not have many options in terms of colors. This is a good-quality animal habitat created by the brand AmazonBasics to cater to the needs of small pets like guinea pigs, ferrets, rabbits etc. Considering the brand value, it is a durable and efficient means of accommodation for small pets and it comes with an Amazon limited one-year warranty. One of the most important features of the Pet Habitat is its iron wire upper frame and PP plastic base. It combined durability and strength. It also has large front and top openings for the guinea pigs to access their home easily. Another major highlight is that it comes as a full-fledged kit for guinea pigs. It is equipped with a non-drip water bottle, a tip-proof food dish, a hay guard and a balcony with an access ramp. It also has a unique hideaway space underneath the balcony for privacy. Besides that it can easily installed with no specific tools needed. As it comes as a fully equipped accommodation kit, including a food dish, water bottle and hay guard it is definitely a cost effective all-encompassing cage option. On top of that it also has a durable iron wire upper wire frame and a plastic base with easy access openings. This ensures the free movement and safe stay of the guinea pig, even if you are installing it outside. It also has a unique hide away space for the guinea pigs’ privacy. It doesn’t need a lot of tools for installation either and it comes in three sizes. The prices of the pet habitat may be slightly on the higher side compared to other guinea pig cages. Besides, since it has a plastic base, it might make it difficult for the guinea pigs to move about inside as they have sensitive feet. It does not have alternative color options either. This is a standard highly efficient complete guinea pig kit from the house of Kaytee, which is an already well-known brand among pet care products. It provides everything that your guinea pig needs and it also comes with a few small surprises. The Kaytee Guinea Pig Kit is called a complete kit for a reason. It comes with an iron mesh cage that has a food dish, a water bottle and also a sample of the Kaytee Fiesta guinea pig food and a sample of the Clean and Cozy bedding. The latches of the mesh cage are also made to be chew-proof. Besides that, it also has a deep scatter less base that is detachable. Being a complete and fully equipped kit, it comes with a food dish, a water bottle and also samples of the Kaytee guinea pig food and Clean and Cozy bedding. This gives you everything that your guinea pig needs, all in one place. Guinea pigs tend to chew a lot of stuff especially in their developing stages. Chew-proof latches are an efficient way to solve that problem. Also, as it has a detachable base, it can be easily cleaned as well. It can be easily assembled with no extra tools as well. For a full-fledged guinea pig kit, it is not available in different sizes. Also, it comes in a single color. It could ideally have had size and color options to make it more vibrant and fun for the guinea pigs. It also doesn’t have a hay guard. This is a large size studio pet home created by Ware Manufacturing meant specifically for small pets like guinea pigs, dwarf rabbits, chinchillas etc. It has storage spaces for different purposes providing the perfect home for your guinea pig. The biggest highlight of the Ware Manufacturing Animal House is that it is 35 inches long and it forms the perfect studio pet home with a counter shelf, a stair step ramp and a chair shaped food dish. It literally acts as your guinea pig’s studio home. It also has a very unique accessory attic storage space. It is 35.5 inches long, 17.25 inches wide and 23.5 inches high. It offers a 35 inches long studio home for your pet guinea pig. And it also comes with storage spaces, stair ways and shelves. There couldn’t be a more luxurious accommodation for your cavy. It also has a unique attic for extra storage space, perhaps for treats and toys. It also comes with wheels, which makes it easier to roll it around. Being a fancy studio home for your guinea pig, it could have more size options for different ages or numbers of guinea pigs that you may have. The same goes for color as well. Since your cavy is getting a luxurious stay, it might as well have color options too. When buying a cage for your pet guinea pig, it is very easy to be overwhelmed because of the many attractive features and options they come with. Plus, there are many amazing brands that prioritize many aspects of a guinea pig’s accommodation and living. However, you don’t always have to pay a huge price just to get all the benefits. For example, your guinea pig might not even like the food dish at home. They might be one that likes to go out and eat food from a separate bowl or from your hands. Hence, it is all about your pet’s likes and preferences and you need to know them very well. Here is a list of check points that you can refer to while you are selecting a guinea pig cage. The size of the cage that you are getting plays an important role in the growth and development of your guinea pig because it affects the quality of life of your pet. Earlier, it was believed that guinea pigs loved small and cramped spaces. But veterinarians suggest that the minimum measurement of a guinea pig’s cage should ideally be at least 7.5 square feet. They are animals that like to roam about and are quite territorial. They like to have specific spaces for their different activities. Hence, be sure to find a cage that has ample space; the more, the better. You might think that the flooring is not that relevant when it comes to cages for your cavy. But the fact is that it is more important than you think. It is always better to go for a solid pan and flat floor instead of a wire mesh floor as it could cause your cavy’s feet to swell and become infected. You can always have a cage that has a wire mesh but also a flat lining. This is more of a given when it comes to choosing guinea pig cages. You want to make sure that the cage allows for ample breathing space and fresh air circulation. This is another important factor to look in to when choosing a cage for your cavy. You want sturdy and durable material, especially if you are planning on installing the cage outside or in your backyard. You also need to look for weather-proof material. Ideally, it should also have a felt covering in order to protect the home and the cavy from any dampness or moisture from bad weather. Since you are going to have to clean your guinea pig’s cage very often, you might as well buy one that has detachable parts that enable easy cleaning. The cage you want to buy is probably going to have to be set up by you, unless you don’t mind spending a few extra bucks on a handy man. If you want to stay away from all that hassle, then you could look for a cage that is easy to assemble and use. The extra features that come with the cage may range from extra storage spaces, to food dishes and water bottles to hay guards and also sometimes fancy fittings. You may want to take in to consideration the basic qualities and characteristics of your guinea pig’s personality. They are very particular creatures that have specific behavioral patterns on different aspects like eating and sleeping. Hence there is no point in getting a cage that has a food dish if your guinea pig doesn’t like to eat from it. You need to consider the portability factor as well. 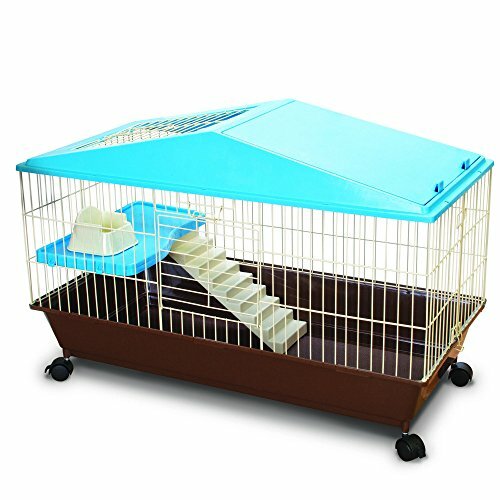 If you are planning to move the cage around, then you need one that is less bulky or one that has wheels. However, of you are planning a permanent space for your cavy, then you can very well spend on a heavy one. Doctors suggest a minimum living space of close to 8 square feet for your guinea pig to live comfortably and happily. So you ideally need a cage that is at least 8 square feet in length and maybe even more if you are ok with it. Small and crammed spaces can cause a lot of issues for your cavy including infections and diabetes. The ideal temperature for guinea pigs is about 65-75° Fahrenheit. This means that the cage should be stored away from high heat sources like fireplaces or stoves or directly under the sun. They should also be kept away from cold conditions like near the windows or doors. Yes, it is very good to have your guinea pig live with you in your house. You can arrange a cage and bedding set up for your guinea pig near your family room, because guinea pigs are very affectionate and enjoy being close with family. Hence it is always best to keep them as close to the family as possible if you want them to be happy. The thing with guinea pigs is that they have specific behavioral patterns when it comes to eating, sleeping etc. So it all depends on your guinea pig’s likes and preferences. If your cavy likes to eat from a food dish and keep to play areas when they want to play, then it would be good if you get a cage that has a tip-proof food dish and divider panels for separate care and play areas. Yes you always need to put guinea pig bedding, no matter what the flooring is. It is not just about comfort. It is also meant to absorb liquid. Unless you want your cage smelling, you best put down sufficient bedding for your cavy. Ideally an animal-friendly disinfectant would form the perfect cleaning solution. Out of all 5 best guinea pig cages of 2018, the best option for you, if you are looking for the best, most luxurious stay facility for your guinea pig is the Ware Manufacturing Animal House. It has cool features and provides a studio home with fancy facilities including wheels to move it around. However, if you are looking for a less-expensive option, then the Kaytee Complete Guinea Pig Kit would be your best bet. It comes with all the fancy features that your guinea pig could use including food and bedding samples. It is quite a steal for the price.